Wedding invitations always look pretty in pink! Take a look at our latest colour inspirations board for some great ideas for pink wedding invitations. Try pale pinks for a romantic, feminine, fairy-tale feel or go for a bold statement with vibrant fuschia and hot pinks! If you really want to be bold, your entire invitation can be a combination of pink shades – add black for added wow factor! Try accents of pink combined with creams, chocolate and other neutral colours for a more subtle statement. Here are some of the invitations our wedding designers offer to make your wedding day perfectly pink! Your wedding invitations are the first impression that your guest will have of your forthcoming wedding and the overall style of the celebration. So when the day comes to announce your wedding to all your friends and family, you will want to make sure it is with impact and style. From the save the date card or wedding invitation to the wedding breakfast stationery and thank you cards – your wedding stationery sets the scene and tone for your wedding day and stamps your style on the wedding that will leave a lasting impression on all your guests. Take a look at our COMPLETE STATIONERY GUIDE for more advice and information to help you choose the most suitable wedding stationery to mark your special day perfectly. Unless you are in a lucky position not to have to consider costs, probably the first decision to make before you start to consider your wedding stationery requirements is to establish your budget. If you are having a large wedding, the cost of wedding stationery can soon mount up. The idea of bespoke wedding invitations may appeal to you but if you are having 200 guests you need to know that you can afford the costs of a bespoke designer! Similarly, you may like the idea of hand crafting your own wedding stationery for that personal touch but be sure that you are up to the challenge of sticking, gluing or printing dozens of invitations when you have dresses to buy, photographers to interview, cakes to choose …. WHAT STATIONERY DO I NEED? MAKE A LIST! HOW MANY INVITATIONS AND WHO TO INVITE? Before ordering your wedding stationery you should be clear about the quantities you will require as some companies, particularly bespoke stationers, may need several weeks or even months notice to produce extra invitations. It could also work out more costly to make additional orders. You should allow one invitation per family or couple. If you are inviting children, their names should also be included on the wedding invitation. Younger adults above 16 would probably appreciate their own invitation. It is also courteous to send an invitation to the groom’s parents, the priest/minister and any guests that you already know cannot make it but would find an invitation thoughtful (perhaps a relative abroad). Always make sure you order some extra invitations in case you make mistakes or have to invite guests on your reserve list. So who should you invite? What is our budget. How many guests can you cater for within our budget? Start your guest list early as it can be a long and complicated job! The first guests on your list should be those people who you really care about, close family and friends you see on a weekly basis. Then you can consider people who have played an important part in your life in the past. Consider if you want to start inviting work colleagues – do you ‘want’ to invite them or do you feel under pressure to invite colleagues? Remember, if you invite a couple of colleagues, others may be offended. Consider the opinions of those who are contributing financially to the wedding – should they have a say in the guest list? Do the bride and groom have similar size families or would it be sensible to invite more guests from one side of the family? Do you want to entertain children at the wedding? So you have decided the number of guests you are inviting and the wedding stationery items that you will need but how do you choose your stationery and order it? The wedding invitations or save the day cards that you send out will give your wedding guests the first view of the style and feel of your wedding day. It’s the first opportunity for you to showcase your big day and let everyone know what is in store. Your wedding stationery should reflect the style or theme of your wedding as well as the appropriate formality of the day. Many wedding stationery designers will offer a wide range of styles and colours while others may specialise in one type of invitation style such as letterpress invitations for more formal invitations or handmade invitations for a more luxurious touch. The first thing you need to decide is the formality of the wedding. 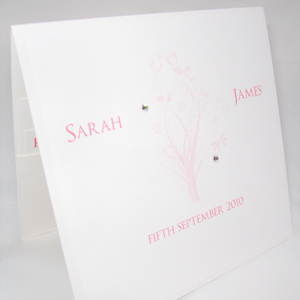 Formal wedding invitations would general suit a more traditional wedding. 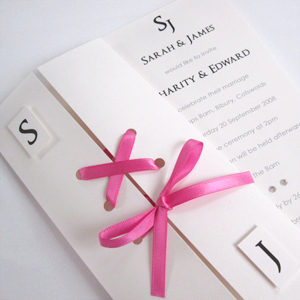 Typically, formal wedding invitations are of a classic design using simple, traditional fonts. The wording is often engraved onto high quality cream or white card in black, silver or gold using techniques such as letterpress or thermography, or you could hire a calligrapher to professionally handwrite your invitations. For more informal weddings there are many styles of invitation to consider – contemporary designs, handmade invitations, printed designs, photo cards, humorous – the list is endless. Certain design studios also offer a bespoke service for brides who have their own ideas about their wedding stationery but who need an individual design service. Themed weddings are also becoming increasingly popular. The ‘theme’ may simply be a range of colours that run throughout the wedding and are incorporated into the wedding stationery, bridesmaid dresses, flowers, table decorations, venue decorations and so on. Or you may choose a more structured ‘theme’ such as a beach theme (sand, seashells, nautical, tropical), nature, floral, seasonal (Christmas, Easter, Summer, Autumn) landmark cities (New York and London are not surprisingly popular themes! ), cultural (oriental, South American, Caribbean) musical (Jazz, country) historical (Tudor, medieval). 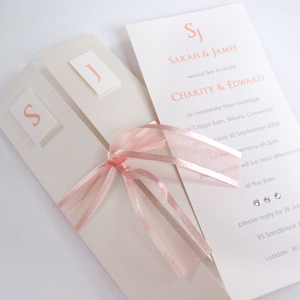 Almost any theme can be adapted and incorporated into your wedding stationery! Once you have decided which style you are looking for, the quantity and the budget you can afford the next step is approach wedding stationery shops or designers to discuss your requirements, order samples and finalise prices and ordering times. Some companies may offer to send you one or several FREE Samples, others, particularly bespoke studios, may ask for a small fee for sending samples, though this is usually refunded if an order is placed. you have left insufficient time to order your wedding stationery you may wish to consider the larger outlets which have many off-the-shelf invitations to choose from. Many brides choose to make their own weddding stationery for budget reasons or simply to add their own personal touches to their wedding stationery. This can be a great way, to get into the spirit of the wedding and add your personal touches. You could make a party of it and invite your bridesmaids to help create! Before you consider the DIY option, you should make sure that you are up to the task. Some designs may appear to be very simple but you may find yourself battling with printers that cannot print on the card you have bought and ribbons that you cannot tie into tidy bows. The whole experience could end up being very stressful and almost as costly as buying your invitations from a professional studio. Remember you may need to buy a paper cutter, adhesives etc., not just the card and embellishments. If you think you are up to the task why not take a look at our DIY guide for ideas and templates.